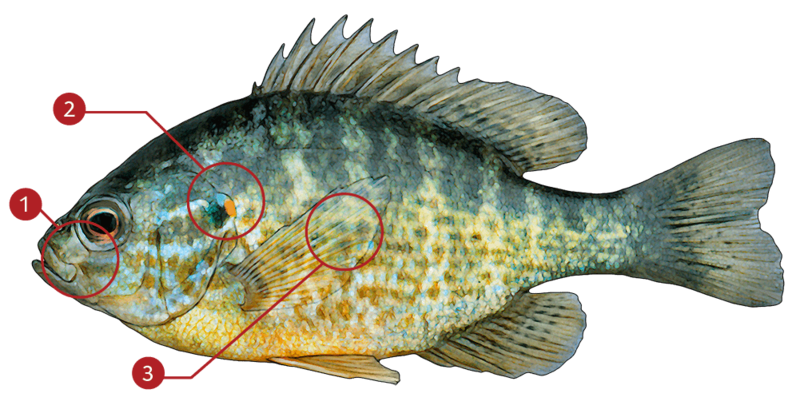 Pumpkinseed sunfish have a flat, disk-shaped body with a small mouth and an upper jaw that stops just under the eye pupil. The gill cover has an inflexible rear edge and short, thick rakers on the first arch. The front dorsal fin is spiny and the pectoral fin is long and pointed and can be extended past the eye when bent forward.Its color ranges from olive-green to brown, yellow, green and blue on the top and sides. The breast and belly are usually a light color such as cream, white or yellow and occasionally orange. Pumpkinseed sunfish can be found in shallow areas with cool to warm water. They are common in farm ponds, small lakes and weedy bays of larger bodies of fresh water. They are also found in upper reaches of creeks and rivers. They are commonly found around cover such as aquatic vegetation or submerged brush and are seldom found in open water. The greatest concentrations of pumpkinseed sunfish are found in the northeastern region of the United States. They are rarely or never found in the south-central or southwestern United States.Groups of young pumpkinseed sunfish school close to shore in substantial numbers in shallow, protected areas but adults tend to travel in groups of 2-4 in slightly deeper yet still covered waters. Pumpkinseed sunfish are more likely than other sunfish to be found in moving water.This species of sunfish are active throughout the day, but will often rest at night near the bottom of the water column or in protected areas in rocks or near submerged logs. They sometimes show a preference for a home range and will remain close to particular areas of a pond or lake. Even when fish are captured and released into a different part of a pond or lake, a significant percentage of them will return to their original location.